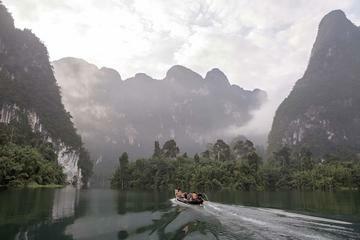 Khao Sok National Park is especially worth visiting should you be a nature orientated traveller. Together with the nearby preserves, this wildlife sanctuary forms the largest and most dramatic tract of virgin rain forest in south Thailand. Not only does the park offer you some of the best hiking trails in the area, it also offers you spectacular sites in a wilderness of breathtaking limestone cliffs. The park is also dotted with dozens of waterfalls, caves and valley view points. Limestone cliffs dominate just about every vista both on and off the enormous Cheow Lan Lake and never more so than in the early morning. Often this is when the lake is covered in a thick white mist that appears to transcend and curl effortlessly around the countless karst formations. It is an experience not to be missed and will surely remain embedded in your memory for years to come if not forever. Best time is between January and April when the skies are clear. Though the park is mostly thickly carpeted in an impenetrable rain forest and home to an array of animals such as elephants, tigers, monkeys, bears, boars and deer among others, along with almost two hundred species of bird, it appears to have more than enough attractions to cater for the enthusiastic adventure seeker. Khao Sok covers an area of 738 square kilometres (285 square miles) then rises to a height of over 1,000 metres (3,300 feet) and includes 100 spectacular islands, formed when the Rajjaprabha Dam here was constructed in 1982. There are two pivotal points in which to begin your exploration of the park. The main one is at the tourist village concentrated around the park visitor centre and trailheads and another one at the Rajjaprabha Dam at the Cheow Lan Lake. Depending on how long you want to stay, it is probably better to start your tour from the tourist village as various trips can comfortably be organised from there and from Phuket. It's also possible to spend a night at the lake if you so wish. The park is a popular wildlife sanctuary for families to go elephant trekking, hiking in the jungle, canoeing on the lake, swimming in the Sok River, bird watching or animal spotting. Most hiking trails are signposted, straightforward, easy to navigate on your own and suitable for all levels of fitness. There are however some trails for the more mature person. It may be worth your while to make at least one off-trail trek into the jungle with an experienced tour guide. The best jungle guides will not only educate you in rudimentary jungle tactics but will also open your eyes to a wealth of unexpected wonders you may have missed should you enter the wilderness on your own. To give you an example, there is a chance you could see the claw marks left behind by sun bears scaling trees in search of honey or medicinal plants used to cure malarial fever or stomach upsets. If you are luckier, you may spot the largest flower in the world. This is a great time to leave the crowds behind and explore Khao Sok National Park on a 3-day tour that combines guided activities with plenty of free time. This tour is for both kids and parents to experience the absolute beauty of this National Park together as a family. So go out there and avoid the masses - and have, not only a great time but a great experience in the peaceful setting of Khao Sok just as nature intended. Here you'll be able to wake up to the sounds of birds singing and gibbons calling from the treetops. You'll be able to bath or simply soak your feet in the majestic Cheow Lan Lake all the while gazing in amazement at the towering limestone cliffs that makes Thailand such a fascinating place to visit. You'll get the chance to really experience what it's like to travel by long-tail boat across the vast lake. And all this while enjoying your first night in a comfortable eco-lodge and another night in the comfort of a floating bungalow. How amazing would that be? If you cannot wait to get started on this adventure you'll find more details by clicking on the photo or link above. This is a lifetime experience like no other. This national park is one of the few places in the world where you may be lucky enough to spot the gigantic Rafflesia Kirrii. The flower is believed to be the largest of its kind in the world, although some say that it's classified as being the second biggest flower in the world. Nevertheless, it's one enormous blossom. In full bloom, the flower can reach 80 centimetres (31 inches). This foul smelling darker than amber cabbage-like tropical plant has no roots or leaves and is wholly parasitic. For most of the year, it lies dormant in the form of microscopic threads inside the roots of a host tree. Once a year a small flower breaks the surface of its host bark. Over several months the bud swells to the size of a watermelon and then unfurls its enormous russet-coloured petals. To witness this phenomenon you need to visit the park between the months of December and March. It is during this period the Rafflesia Kirrii emits a rather disgusting fetid smell to attract green-headed houseflies who then assist in its pollination process. After a few days, the orange-red flower shrivels to a vile unsightly putrescent mass. The fly you see is grabbing the plant's pollen. At the entrance to the park, you're likely to be met by guest-house staff offering free lifts to their accommodation within the grounds. Ignore them if you're only staying the day. At the tourist village, there are around twenty bungalows along with half a dozen mini-markets, laundry services, email centres, and massage spas, a true lifesaver, especially after a gruelling jungle trek. Be aware that Khao Sok gets notoriously humid at times. I have to admit that just one tour of this magnificent park is not nearly enough. You may want to stay one, two or even three nights depending on how long it takes you to explore all the wonderful sights and sounds here. If so, there are several guest houses within the park in which to choose. Take your time to find one to suit your special needs. There are family size bamboo and wooden guesthouses, mountain view bungalows, river-raft chalets on the lake and tree-style houses in the jungle. Contact me should you need help in this department. The park is located about halfway between the southern peninsula's two coasts, that of the Gulf of Thailand and the Andaman Sea. It is easily accessible by road from Phuket, Khao Lak and Surat Thani but you can drive up from Krabi too. The main access road to the visitor centre at the park is from the junction town of Takua Pa so if you're driving north from Phuket, take the coastal route towards the town of Khao Lak and from there, a ninety-minute drive to the park. The drive from Takua Pa is less than an hour. Take Highway 401 if you are coming from Surat Thani in which case travel time will be about two hours. Khao Yai is the oldest park in Thailand. A mix of evergreen and deciduous tree forest and grasslands with scrub as its secondary growth. Endangered wildlife such as elephants, tigers, leopards, white-handed gibbons and sambar stags roam its interior. Doi Inthanon encompasses the highest mountain peaks in Thailand. It has several types of fauna and flora, waterfalls and a wide range of animal life such as leopard, Pangolin and flying squirrels. Also, several bird species such as the hawk, eagle and Eurasian woodcock. Ang Thong is a small group of islands spread over part of the Gulf of Thailand west of Ko Samui. The region is popular for its beautiful beaches, limestone caves and abundant wildlife. Canoeing and snorkelling are major attractions.